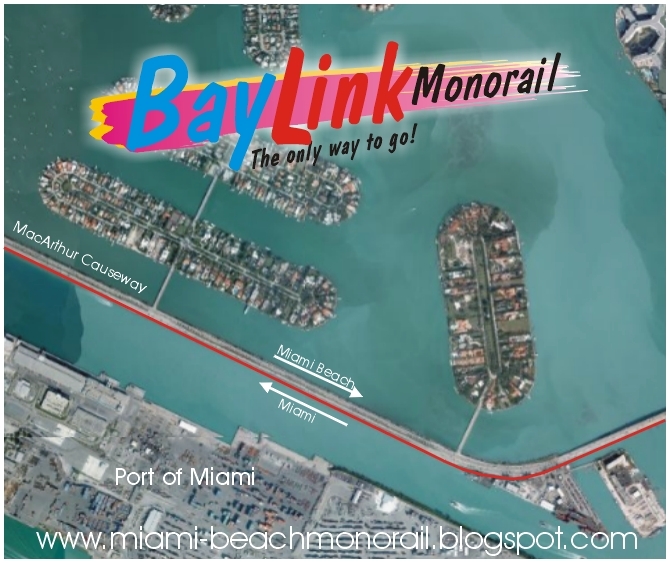 We urge you to use the power of your office to push for a monorail solution for BayLink. We believe the current proposal of a light rail trolley car will contribute to instead of correcting the problems inherit in transporting large numbers of people between Miami and Miami Beach. By its very nature, slow-moving, lane hogging trolley cars impede traffic. The narrow streets of South Beach cry out for a different solution. This is ours. Regarding mass transit, we believe any solution that isn't off the grid is part of the problem. When traffic arteries are already clogged, you can't solve the problem by adding another means of fixed-track transportation to the congested grid. You can only solve that problem by either going over or under it. Going over is less expensive. 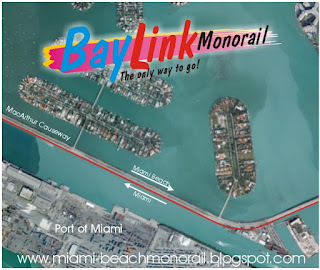 Our BayLink monorail solution is less expensive and disruptive and much quicker to build because 80% of it runs on beach sand and at grade along the MacArthur Causeway. Working around existing utilities is virtually eliminated and the need to build elevated piers for the monorail for nearly a third of its run is unnecessary. Our solution offers convenient connections to existing and proposed mass transit. Under our plan, it would be possible to take a commuter train from Palm Beach to the Miami Beach Convention Center with only one transfer. Construction and maintenance costs could be reduced further by offering concessions to the private sector. The $200 million budgeted for the Miami streetcar project should be directed towards developing a BayLink monorail. 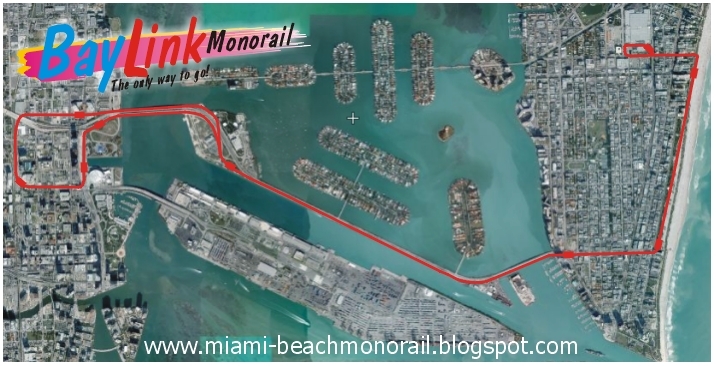 *The Miami Beach run is a two-way dual beam 3.3 miles long. *Cost per mile per county share: $10.8 million. *Construction time: 30-36 months with an additional 6-months for testing. Our consultant wants it known that "the proposal has given thought on how to mitigate the impact of construction on existing road traffic. It is suggested that serious consideration be given during the design stage to evaluate the feasibility of using single large bored pile foundation and column as a contiguous structure. The columns could be clad externally to better embrace some art form that befits the local ambiance." The 3.1 mile MacArthur Causeway run and the 3.3 mile long north-south run along the sands of Miami Beach takes advantage of a unique set of conditions found only here. 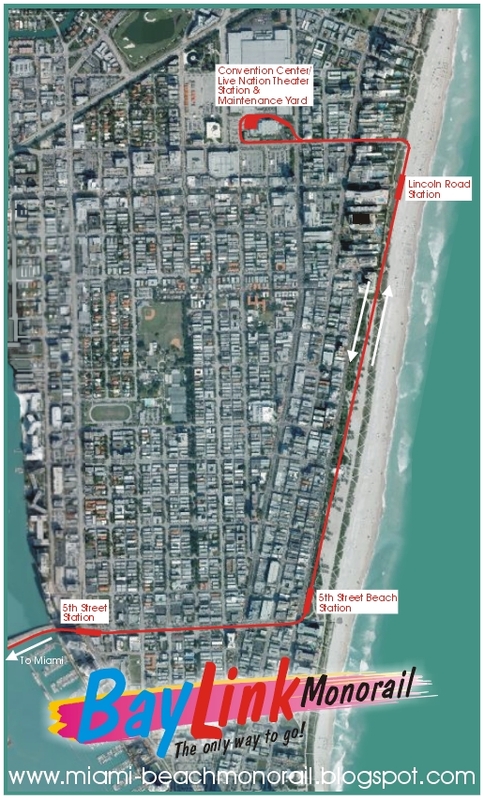 Instead of disrupting the lives of hundreds of thousands of people over many years while tearing up miles and miles of streets to lay trolley car tracks and to realign underground utilities, 80% of our solution runs where none of the aforementioned problems exist: on the south side of the MacArthur Causeway and over beach sand. Unlike the current default BayLink plan, archaic, lane-hogging, slow-moving trolley cars with their ugly overhead power lines will not be forced onto narrow streets with stations every few blocks. Our approach is to get people from one side of Biscayne Bay to the other as quickly as possible with a minimum of stops where they are needed the most. These "People Magnet" stops include Lincoln Road/Beach and the Convention Center/Live Nation Theater on the beach side with mainland stops at Carnival Center, American Airlines Arena, Museum Park and, although it doesn't currently exist, the "Grand Central Station of the American Pastime." Our forward thinking design makes it possible to take a commuter train on the FEC tracks all the way from Palm Beach to the Miami Beach Convention Center with only one transfer. Although it isn't inexpensive, we are suggesting sharing the costs to build and maintain it through a joint venture between public and private enterprise. We are also advocating directing the $200 million allocated for building a downtown Miami streetcar towards the BayLink monorail. Anyone who wants to buy a car must bid for a "Certificate of Entitlement" (COE). Bid prices vary depending upon the number of units available for bidding and the size of the car. Unless someone can show proof of owning a COE, that person cannot buy a car. The COE is valid for ten years and the bidder pays the lowest successful price for that category. COEs are not transferable. COEs can be re-evaluated after ten years for an extension of another five or ten years. However, if one bids and wins an extension, no further extentions will be entertained, i.e., after the extension, the COE no longer becomes renewable. You can bid for a COE via an ATM, phone banking or online banking facilities at participating bank and new car dearlerships. The money raised by selling COEs to the public helps fund public transportation-- from building new mass transit lines to maintaining and improving infrastructure. There are three car sizes. Category A: Cars up to 1600 cc. Category B: Cars above 1600cc. 601-1000cc = $400.00 + 0.25 cents for every cc above 600 up to 1000. 1001-1600cc = $500.00 + 0.75 cents for every cc above 1001 up to 1600. 1601-3000cc = $950.00 + $1.50 for every cc above 1601 up to 3000. Over 3000cc = $3050.00 + $2.00 for every cc above 3000. As an example, if you own a big monster with 6000cc, you pay $3,050.00 PLUS $2.00/cc above 3000 which is an extra $6,000.00 or $9,050.00 PER YEAR. In summation, we believe the proposed light rail trolley car plan is archaic, lacks vision, and becomes part of the problem instead of the solution. Besides being inherently ugly and susceptible to the ravages of salt air, the overhead electrical lines employed to power the trolley cars are its weakest link during a hurricane and should automatically disqualify it from consideration. Our solution, besides being less disruptive since block by block of city streets won't have to be torn up to lay track and move utilities, will come on line much, much sooner once construction begins. And maintenance, due to our plan's simplicity, will be much less. Other reasons why we believe a monorail is the best solution can be found here. We hope you will seriously consider our proposal and use your power as an elected official to make it reality. All it takes is a little vision on the part of the people and their elected officials. Until then, remember our rallying cry: Free our streets! Grab the Vision and lets Monorail! 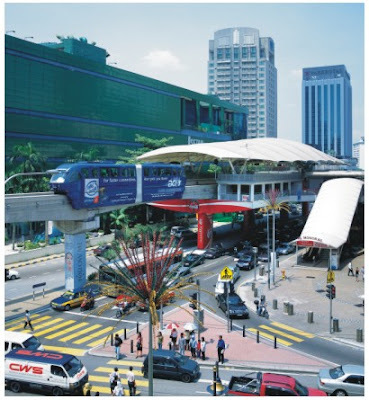 *Our retired transportation engineer spent the last 40 years in Asia planning and designing public transport for Calcutta, Singapore and Kuala Lumpur. 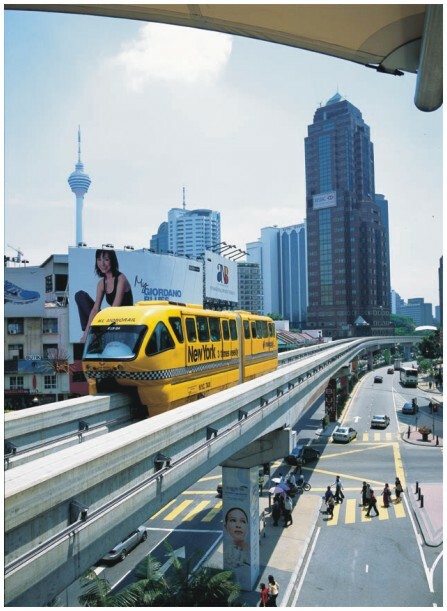 The Kuala Lumpur monorail is carrying an average of about 60,000 passengers per day. 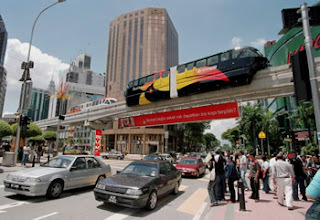 Monorail Malaysia, in which he played a principal role, was given three months by the Prime Minister of Malaysia to design, build and test a prototype to prove that his company was up to the task at hand. They got the go-ahead by the end of May 1999 and invited the prime minister to test drive the prototype on a 100-meter test track by September of that year. The system opened on Aug. 31, 2003. Photos courtesy of our retired good friend. The Miami Beach run is a two-way dual beam 3.3 miles long. Cost per mile per county share: $10.8 million. Construction time: 30-36 months with an additional 6-months for testing. 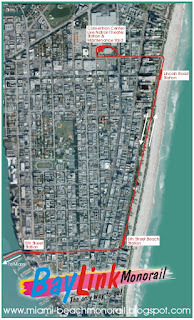 The 3.1 mile MacArthur Causeway run and the 3.3 mile long north-south run along the sands of Miami Beach takes advantage of a unique set of conditions found only here. Instead of disrupting the lives of hundreds of thousands of people over many years while tearing up miles and miles of streets to lay trolley car tracks and to realign underground utilities, 80% of our solution runs where none of the aforementioned problems exist: on the south side of the MacArthur and over beach sand. Unlike the current default BayLink plan, archaic, lane-hogging, slow-moving trolley cars with their ugly overhead power lines will not be forced onto narrow streets with stations every few blocks. Our approach is to get people from one side of Biscayne Bay to the other as quickly as possible with a minimum of stops. Of course, besides stops at Lincoln Road/Beach and the Convention Center/Live Nation Theater, our monorail stops at Carnival Center, American Airlines Arena, Museum Park and, although it doesn't currently exist, the "Grand Central Station of the American Pastime." Our design makes it possible to take a commuter train on the FEC tracks all the way from Palm Beach to the Miami Beach Convention Center with only one transfer. Although it isn't cheap, we are suggesting sharing the costs to build and maintain it through a joint venture between public and private enterprise. We are also advocating directing the $200 million allocated for building a downtown Miami streetcar towards the BayLink monorail. All it takes is a little vision on the part of the people and their elected officials. MVB from the get-go has seen itself as a gadfly (or roach) regarding our community. Not content just to post ideas, we are pro-active in trying to get others to see things our way. Most elected officials have been contacted and, believe it or not, we may have actually convinced at least one Miami Beach commission candidate to see it our way. Only time will tell. Until then, remember the MVB rallying cry: Free our streets! Grab the Vision and lets Monorail! Maybe we should cut back on the mojitos, but we're beginning to think MVB may be having some influence on shaping Miami's future. From the beginning we saw MVB as a digital gadfly/cockroach of ideas and criticism of the local scene. In that regard, we made sure our ideas were made known to those involved with the topic. Now, for the first time, we learn in Miami Today that Glenn Straub, owner of the Miami Arena, is interested in speaking to Cirque du Soleil about making his arena a permanent home for Cirque. Although he admits Cirque has not contacted him, we made sure he and Cirque knew about our vision for the Miami Arena through numerous emails with links to our posts. The same goes for MLB and the Florida Marlins. We are excited about the Marlins insisting on a downtown site. Although their first choice is very close to our site which we lobbied for since 2003, perhaps this is the time for the city and the county to step in and bring all the parties together to choose a central, unified site that connects the Miami Arena and a downtown baseball stadium with existing commuter rail (FEC tracks, MetroRail) and a future BayLink (monorail). We call it the "Grand Central Station of the American Pastime." We think it is the best idea of any of them that have been thrown out there because it is built over existing mass transit. This fact alone will supply the downtown baseball stadium and Cirque with a lifeline of fans who will be more than happy to give up their cars to get downtown to see a game or the latest Cirque show. Fans from as far away as Palm Beach will be able to hop a commuter train and travel to a game without ever fighting traffic or searching for parking. Best yet, they'll never have to pay an exorbitant parking fee again. If it's raining, they'll never know it because they'll get on and off the train inside the enclosed atrium connecting the stadium to the arena. 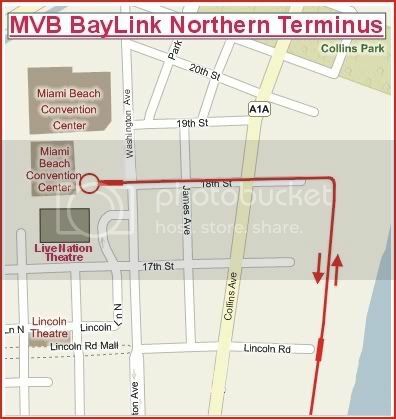 BayLink will offer the same hassle free trip to the ballpark for the thousands of fans living on Miami Beach. All it will take is a little vision on behalf of everybody. Perhaps Miami's Mayor Manny Diaz or County Mayor Carlos Alverez would like to step up to the plate and make this happen. Oh, yeah, you can rest assured that we have forwarded this posting to them. Become an MVB FACILITATOR! For those who also think this is the best solution for the survival of a downtown stadium and an arena based attraction, feel free to let our government officials know by emailing your thoughts to them through our handy-dandy email contact list found on the right side of our home page. UpDate (4/27/07): The Miami Herald reports that the plan to help build a downtown Miami baseball stadium which was passed in the House won't be heard in the Senate, basically killing any chance to see a $60 million tax subsidy spread over 30 years. Instead the Senate is considering a watered down allocation to be split between three professional teams netting the Marlins a one time payment of $32.6 million. 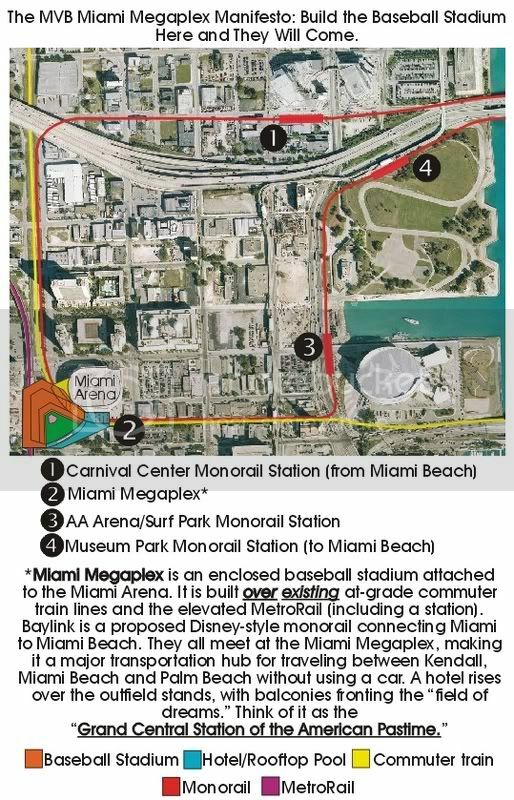 The Miami Megaplex is seen as a practical, cost saving solution to building a baseball stadium in downtown Miami. By engaging the Miami Arena and bringing in a hotel, it spreads the enormous cost of building such a structure. Instead of giving away valuable public land which is in short supply, this plan needs only street closures. Success is ensured because of the symbiotic relationship between the five major players (including government and the FEC railroad): the stadium and the Arena can be used for everything from baseball games to tractor pulls and concerts. The hotel can book rooms and conventions based on the unique location and ability to tap as much convention space as needed by using the Arena and the stadium. Since it is built over a major transportation nexus, attendance will rise and rooms will be booked because everything is easy to get to-- no more fighting traffic-- and inexpensive-- no exorbitant parking fees . Finally, the Miami Megaplex will someday help us land the Summer Olympics, where access to gymnastics, basketball, baseball, surfing, and boating events off of Bicentennial and Bayfront Parks are all within walking distance. Can’t you just see a parade of nations marching along Biscayne Boulevard into the Miami Megaplex for the opening and closing ceremonies? The boys at MVB sure can. If you are as fired up as we are with our idea, please let your elected representatives know. We like to think of the Miami Megaplex as "the Grand Central Station of the American Pastime." Right now, it sure beats out the county commission's latest idea which is building the stadium at the Orange Bowl. Besides being in a dreary, boring part of town, the location has no access to mass transit. For a more detailed examination of our proposal-- which includes Disney's involvement and some really cool roofed stadium renderings-- click here. Please note, regarding the "commuter train." It's not here yet. The tracks are and negotiations are underway to lease them from the FEC railway. As for BayLink, it's a pipe dream being held hostage by obstinate nimbys and visionless elected Miami Beach officials. We believe BayLink will save Carnival Center if a station is built across the street from the opera house. We also believe it will save the planned art and science museums in Bicentennial Park. And, it will even save Miami Beach from itself-- traffic gridlock and a poorer quality of life by getting cars off the street (we advocate building the north-south run on the sands of Miami Beach). 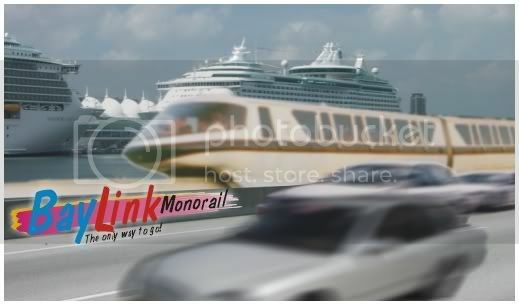 It will really save everyone if it's the people-friendly, proven monorail most people can't wait to ride. Disney has licensed that design to Bombardier. Other proven designs are available. First MVB posting re this idea (8/24/06), MLB's first choice for a downtown stadium looks a lot like ours (9/15/06). Hey, Mickey! Do we have a deal for you! Disney announced yesterday that it is considering creating smaller theme parks and stand-alone hotels, retail, dining and entertainment centers. Well, does MVB have a deal for you! In exchange for sharing the cost of building, running, and maintaining a monorail connecting Miami with Miami Beach, the county will be happy to lease you public land in both cities to build two hotels, one at both ends of the run. 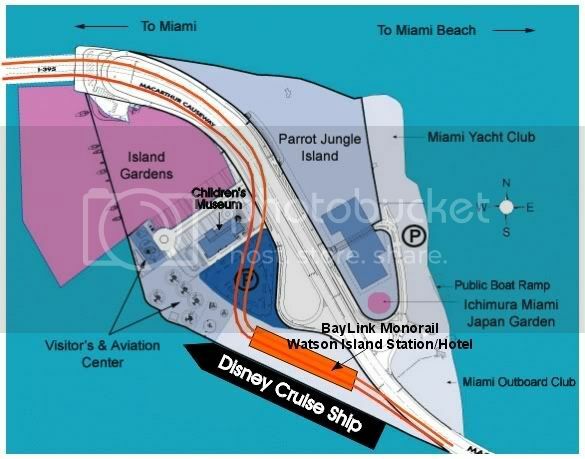 Plus, the Miami site will allow you exclusive rights to dock your cruise ships. With Miami becoming a port of call, you will be able to offer your passengers a day on trendy SoBe and a night at the opera, the ballet, or a symphony at our new half-billion-dollar performing arts center-- with an ease of transit between everything just like it is at Disney World. Your proven monorail system will run at grade along MacArthur Causeway saving millions of dollars in construction costs. Rising on both ends, it will run along 5th Street and head north along the beach. On the Miami side, it will loop around the new Carnival Center for the Performing Arts and connect to MetroRail and the MetroMover. Who knows, by then we may even have a downtown baseball stadium where Disney guests from the hotels or the cruise ship can opt to take in a baseball game-- as well as catch a Miami Heat game or a concert at the American Airlines Arena. Miami is the only city serving cruise ship passengers that can offer this many choices. So, little mouse dude, is this a great idea or what? What's wrong with this picture? As far as MVB is concerned, nothing. Recent talk about building a $200 million trolley car system in Miami is getting some mixed reactions from Miami commissioners-- and well it should. We're against the trolley car for a host of reasons which can be found here. 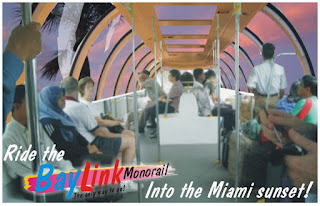 We're for a monorail system linking Miami and the Beaches which can be found here. 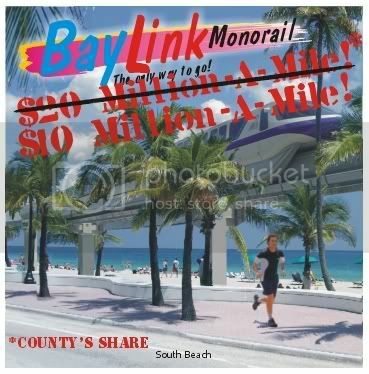 That $200 mill could help make a high-speed link between Miami and the Beaches a reality much sooner than later-- especially if some forward thinking visionaries could lure Disney in to co-build BayLink with the promise of land for a hotel on the beach and a port on Watson Island. 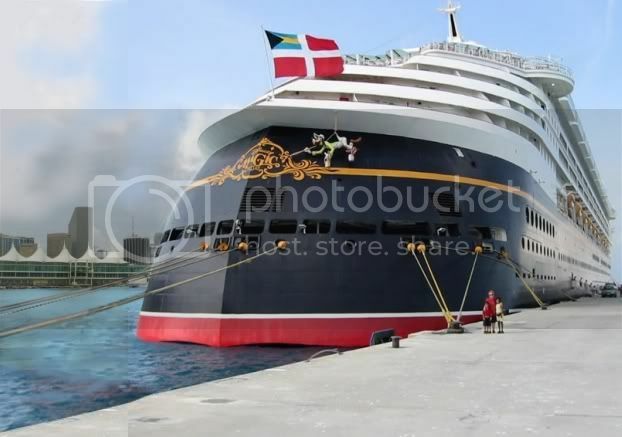 Getting a Disney cruise ship-- or any cruise ship for that matter-- to make Miami a stop instead of only a point of departure will benefit everyone in the county-- especially when tourists and locals can get back and forth between Miami and the Beaches quickly and with little hassle. In 2002, Miami-Dade County voters, by a 2-to-1 margin, funded the People’s Transportation Plan by approving a sales tax increase (6.5 percent to 7 percent) solely dedicated to transportation. 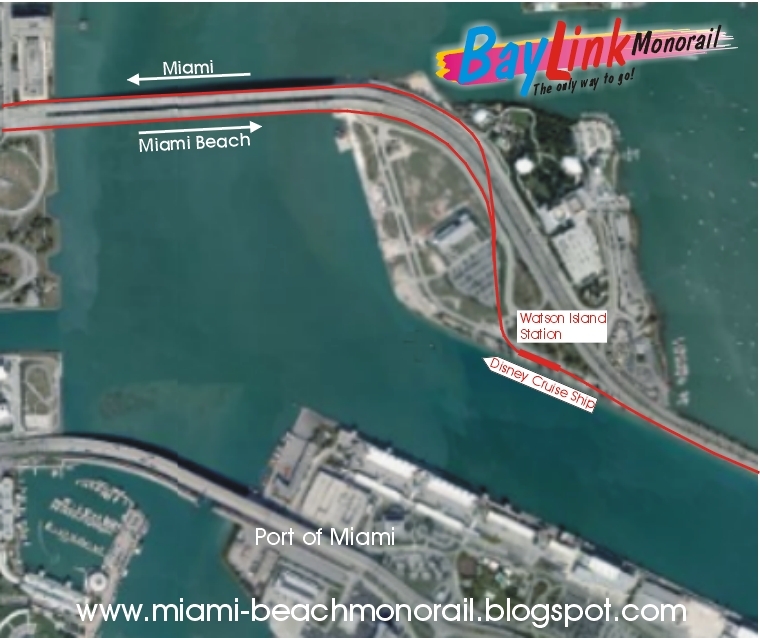 Part of that plan included a mass transit "BayLink" between Miami and Miami Beach. In the beginning consulting engineers were recommending light rail. Led by Miami Beach mayor David Dermer, the city later rejects the will of the people fearing that construction will be disruptive and that the proposed solution will contribute to the problem. 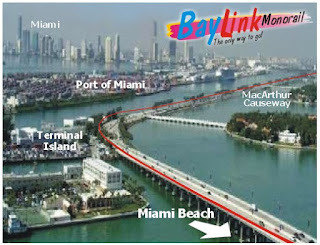 They force another election in 2006 onto the citizens of Miami Beach regarding BayLink. The citizens overwhelmingly vote to bring it on no matter what it looks like. As of this posting, because of the city's stonewalling, BayLink has been put on hold and other projects pushed forward. Currently, Miami Beach is only considering a compromised solution: light rail trolley cars. This site hopes to convince them and others to consider a monorail. We believe it is the quickest, most cost effective, and less disruptive solution.